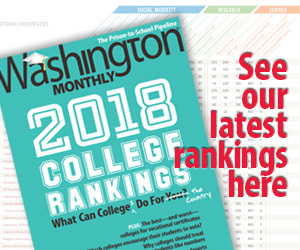 Washington Monthly | Do We Have Basic Minimum Standards? Do We Have Basic Minimum Standards? Do you think this is the kind of country that would replace Barack Obama with a president who mocks people for their disabilities? This is actually a serious question. The most disquieting aspect of Mr. Carlson’s report of Mr. Bush’s language is not what it says about Mr. Bush’s ability to dignify politics after President Clinton’s squalor. Rather, it is that Mr. Bush may have been showing off for Mr. Carlson, daring to be naughty. He may be proving his independence, which Mr. Carlson likes, but it is independence from standards of public taste — not the sort of independence many voters will be seeking in a successor to Mr. Clinton. Nothing remotely resembling the King-Tucker exchange that Mr. Bush describes appears in the transcript of Mr. King’s hour-long Jan. 14, 1998, program. And it is difficult to imagine anything Mr. Bush said that Mr. Carlson may have “misread” that could do Mr. Bush credit. I also know that the Bushes were the precursors to the current post-truth party. For example, after Carlson reported on Bush’s mocking of a woman he had condemned to death, and also on Bush’s liberal use of profanity, he got some major pushback from the campaign. When Carlson says that Karen Hughes “almost crosse[d] over from bravado into mental illness,” he could just as easily be describing Donald Trump. When Bush mocked Karla Faye Tucker, he did it in the privacy of the backseat of a car. His campaign could and did deny that it ever happened. Donald Trump mocked New York Times investigative reporter Serge Kovaleski’s disability on a stage in front of thousands of supporters. There’s no denying that he did it or what he meant by it. At another point, Trump said that conservative commentator Charles Krauthammer, who is partially paralyzed, “couldn’t buy a pair of pants.” That was also captured on camera. So, even if there isn’t as much difference between George W. Bush and Donald Trump as people might think, there’s a lot more ammo to use against Trump. So, I ask again, is this the kind of country that would replace Barack Obama with a president who mocks people for their disabilities?